Born to a Dutch father and Mexican mother, the Arizona native sees the rewards of his dedication to the sport he loves. PHOENIX — Rickson van Hees is only 16 and is experiencing the rewards to the dedication and hard work he puts into the sport he loves: soccer. The Arizona teen recently signed a professional contract to play in Holland. Rickson was born in Glendale, Ariz. to a Dutch father and a Mexican mother. Since he was a boy, he showed his passion for soccer in Arizona while he played at the Club SC del Sol. He left the club team at 13 to move to Holland when he was recruited to play with Club Vitesse. 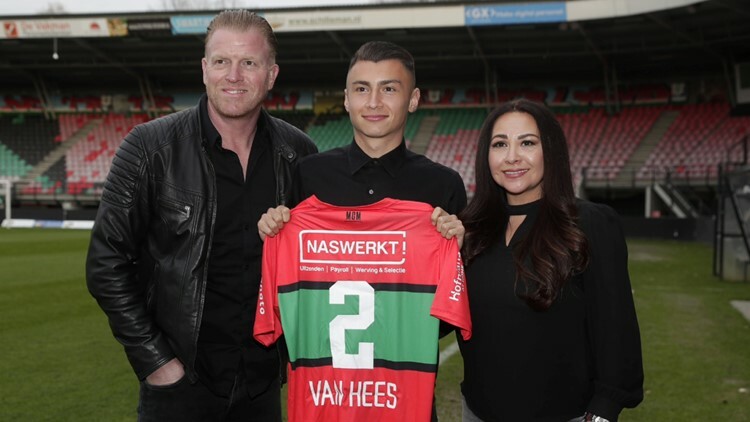 Rickson is not even 17 and he signed his first professional contract with Club N.E.C Nijmegen in Holland. He’s been playing defense with them for a season in the sub-17 level for the Eredivisie league. Rickson said he feels fortunate to have this opportunity to play as a starter and is grateful to the club that has been polishing him during the last few months. He thanks his parents for always supporting him and for all the sacrifices and efforts they’ve made to him to reach his goals. Rickson added that it’s a huge step in his career. Surrounded by family, his trainer and the director of N.E.C, Rickson was officially presented with his team shirt with his last name and did an interview in Dutch. Los padres de Rickson lo acompañaron cuando firmó contrato profesional para jugar en Holanda. It’s hard to stay in the basic forces of this club because there are so many talented young men, and everybody is working hard to keep their places: therefore, Rickson knows he has to work really hard to keep his place. Rickson said he’s excited, as his parents are, to see where this new stage will take him. “The signing of the contract reaffirms my compromise to always give more than 100%,” said Rickson.